The global standard for gluten quantity and quality calculation. When baking bread and producing noodles or pasta, the flour gluten levels and strength will determine the quality of the product. The Glutomatic System is the global standard for determination of gluten quantity and quality. The effect of gluten quantity and quality in the flour used for breads, cookies, crackers and pasta is noticeable. In the photo of three loafs of bread below it is clear that the wet gluten quantity of the flour strongly influences bread volume. Using the Glutomatic System you are able to determine the quality of wheat and flour. Gluten is the functional component of protein and determines many of the dough and processing characteristics of wheat and wheat ﬂour. Gluten consists of the two specific proteins “Glutenin” and “Gliadin”. It is not until a dough has been made that they form gluten. This is why is is not possible to determine gluten in wheat without actually making a dough. Flour, water and kneading are all needed for gluten to form. 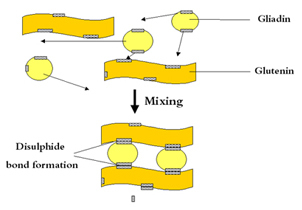 I disulphide bond is then created between the glutenin and the gliadin. 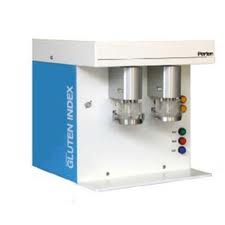 Wet Gluten is prepared from wholemeal or ﬂour by the Glutomatic 2200 gluten washer. Gluten Index Centrifuge 2015 is used to pull the wet gluten through a uniquely designed sieve cassette. The relative amount of gluten crossing the sieve indicates the gluten qualities.The wet gluten is further dried in the Glutork 2020 for dry gluten levels and water binding in the wet gluten calculation. The steps are illustrated in the picture at the bottom of the page. Click the picture to enlarge it. Weighing 10.0 g ± 0.01 g of wholemeal or ﬂour is weighed and put into the Glutomatic wash chamber with an 88 micron polyester sieve. When vital wheat gluten is measured, 1.5 ± 0.01 g is weighed. Dispensing 4.8 ml of saline solution is added to the meal or ﬂour samples. No saline solution is added to vital wheat gluten samples. Mixing Meal or ﬂour and the salt solution are mixed to form a dough over 20 seconds. Washing After ending of the mixing phase, the washing automatically starts and continues for ﬁve minutes. For wheat meal the sample is moved to a chamber equipped with a coarse 840 micron sieve allowing bran particules to be cleaned out. Centrifuging Exactly 30 seconds after completed washing, the undivided wet gluten is transferred to the special sieve cassette and centrifuged exactly one minute at 6000 ± 5 rpm in Centrifuge 2015. Weighing The fraction passed through the sieves is scraped off with a spatula and weighed. The fraction remaining on the inside of the sieve is collected and combined with the balance. The total wet gluten weight is calculated. Drying The total wet gluten piece is dried at min. 150°C during four minutes in the Glutork 2020. After drying the gluten is weighed. Calculation The amount of gluten remaining on the centrifuge sieve in relation to wet gluten weight is the Gluten Index. You also need a lab mill model LM 3100 or LM 120. The Glutomatic System is used globally by thousands of grain traders, flour millers, breeders and pasta/noodle manufacturers, all of whom benefit from its features. Easy to use – Easy to operate by non-technical personnel. For flour and grain – Using Glutomatic you need not produce a flour to determine the gluten characteristics for a wheat. You save time and costs as the Gluten Index method can work both for flour and for ground wheat. 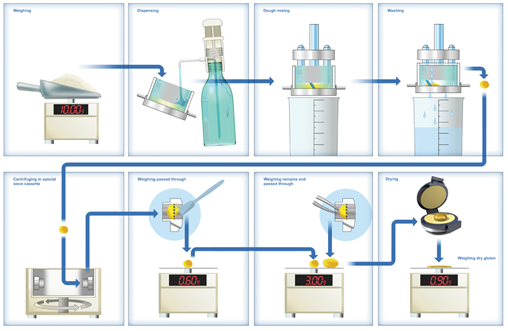 Rapid analysis – A complete test can take under 10 minutes. Determines true gluten – While gluten is in correlation with protein, there are a number of cases where a wheat would have a high protein content, but no or very weak gluten. Glutomatic is a definite way to know for sure. For fully automatic gluten quantity and Gluten Index determination with pipette, pump system and electronic timer for dough-mixing and washing times, for double determinations. 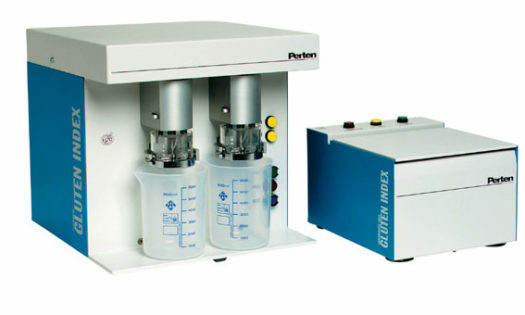 High accuracy speed controlled centrifuge for the Gluten Index method. Operation 1 minute at 6000 +/- 5 rpm with electronic timer and safety locking for lid. Incl. 2 special sieve cassettes for Gluten Index. For dry gluten determination from Glutomatic in 4 minutes at 150°C between teflon-coated heated plates incl. automatic contact breaker after 4 minutes.